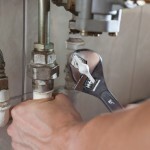 How Plumbers Fix a Clogged Drain | A Step Above Plumbing Inc. How Plumbers Fix a Clogged Drain | A Step Above Plumbing Inc.
Having a clogged drain in your home is a problem that most homeowners will have to deal with at some point. Usually, a clogged drain can be dealt with without the help of a professional plumber by using a plunger, chemical drain cleaner, or by using a drain snake, but sometimes, the problem is bad enough that you need to call for professional help. Plumbers have an array of specialized equipment at their disposal to deal with any type of clogged drain. Often, they have drain snakes that are not only much longer than the typical household variety, but also motorized. These snakes can reach clogs that others cannot, and with the help of the motor be able to break up tough clogs that are too much for a simple hand-cranked snake. Sometimes, a plumber will want to get a look at exactly where the clog is, and what is causing the blockage. For this, they have special drain or sewer cameras. A drain camera is a small camera equipped with a light connected to a long length of stout hose. These are fed down a drain or sewer line much like a drain snake. Typically, a drain camera will have an LCD monitor connected to the opposite end of the hose so that the plumber has a live video feed from the camera. One newer solution to clogged drains is called water jetting. A water jet works like a drain snake except it has a high-pressure valve on the end that blasts the clog with water. Some water jets have multiple heads that can be attached. One head blasts water straight ahead to create a hole in the clog while the second head sprays water to the sides to clear the interior walls of the pipe.